California trying to pass law to lower voting age. We don’t trust them to make a decision about whether it’s ok to have a drink or not, but sure, let’s trust them with everyone else’s tax money and making laws. What could possibly go wrong? @big freedom, What is wrong with California? @WifitheRouter, a lot of things, a lot of people here seem like their straight up detarded. *edit- detarded is a joke from trailer park boys not a typo. @big freedom, it’s almost like the people in charge know that their party is popular with groups that can’t vote so they’re trying to find ways to ensure they stay in power. @WifitheRouter, they're trying to out-Florida Florida. @Donald Drumpf, so if an admittedly shallow search doesn’t uncover it, it doesn’t exist? That’s incredibly naive of you. California is a banana republic. Run almost entirely by 1 party. There is a committee within the state legislation that is actively trying to reduce voting age. Gtfo with your lack of any skepticism at all, unless it’s something that doesn’t confirm your bias. @big freedom, wait is the legal drinking age 18 where you live? Or is the legal voting age 21? @Donald Drumpf, HOLY FÛCKING SHÎT. I literally google searched “California considers lowering voting age” and got an entire page full of results. But of course they’re all from super conservative publications... like NBC, the LA Times. Seriously, how big of a shill are you? @big freedom, one dude trying and failing to get anyone else to vote with him is not "OMFG all of California is so stupid letting children vote"
@Donald Drumpf, I’m taking a screen cap of your comment and a screen cap of the results and submitting it. @big freedom, did it pass? No. Did anyone other than the author support it? No. Were there any follow up articles? No. Are you making up a strawman? Yes. @Donald Drumpf, 🤦🏻‍♂️ I will explain this slowly. Using small words so you can understand... California (a state within the United States, on the west coast) is considering and TRYING (that means an attempt is being made, not necessarily completed yet) to pass a law that would allow children (that’s what we call people who aren’t adults) to have the right to vote in an election (that’s the process we use to elect a representative government). @Donald Drumpf, was there an election in 2017 dolt? A fûcking legislator introduced a bill to change the state constitution. Where is that not trying to change the voting law? You are so far out of your depth here that it’s literally impossible to see things from your point of view. I’m open to hearing rational reasonable arguments but you have never presented a single one. @Donald Drumpf, a person who lives in California... assemblyman Evan Low D-Campbell. Do you not understand what an elected representative is? @big freedom, California: "hey should we do this thing? No probably not so we wont do it" You: "I can't believe California is doing the thing!" @Donald Drumpf, I can’t even... how do I explain... ya see the people of CA elect officials to congress in a representative government. Those people write laws that the rest of the elected officials vote on. When I, or ALL of the newspapers writing about this story, say “California is trying to pass a law” that does not mean that every single person in that state is actively involved in that process. I feel like you’re either A. The best troll to ever troll, or B. Literally too stupid to make fun of. But once again, you’ve reminded me that it’s hard to win an argument against a smart person, and it’s impossible against a stupid. @Donald Drumpf, my original statement... CA trying to pass law. Nice straw man tho. Did you build it yourself? @big freedom, how the hell is not doing a thing still doing a thing? @big freedom, right... you can vote at 18 but can’t drink until 21. So we already trust people to vote even if they can’t drink, right? Depending on the state you can register to vote as young as 16 or 17. @big freedom, you read "stupid thing" followed by "California" and in a brilliant moment of word association, decided that California must be doing the bad thing before stopping all rational thought past that point. Let's play a game, I want you to remember today and wait for the day that California actually passes such a law, which it never will. In the meantime I have another Google search for you "you're not going to believe what I'm about to tell you"
@big freedom, The voting age is 18. The drinking age is 21. This has been common law for sometime now. I think their 60s or 70s when it passed. I could see making it 17 years old. 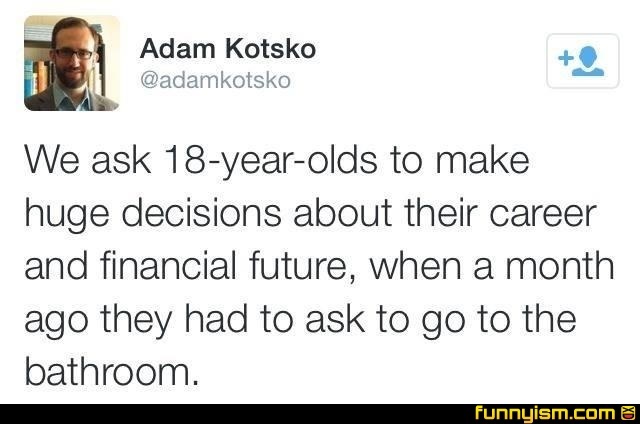 Since they want to trial 17-year-olds as adults lately. And if they’re old enough to be treated as an adult in the court of law, then they’re old enough to vote. Would be my counter argument. Whether or not it’s the best decision I don’t know. But if you’re old enough to get drafted you’re old enough to vote is how I see it. And one of the primary reasons why the voting age is 18. I’m not even going to waste time looking up the article on California because it’s not going to pass. I’m sure there probably is a couple people that want it to pass. But it’s not going to. One or two people does not constitute the entirety of a political party let alone the entire state. There’s always a couple people with crazy ideas. But that doesn’t mean everyone around them supports those same crazy ideas. @Seohn, yes, we changed the voting age to 18 because of the draft. But we don’t draft any more. And it’s been proven that the human brain doesn’t develop (especially the frontal lobe that is responsible for decision making) until around age 25. Kids are definitely growing up slower now than they did in previous generations. I’m in favor of not trying someone as an adult until 21. And same argument as Drumf? Saying “California is trying” does not mean that every single person in the state is on board. It means that an elected official has introduced a bill. Whether it passes or not was not my argument. It’s the fact that it’s been introduced. Democrats know that kids would obviously vote very liberally. What 17 year old wouldn’t vote for higher minimum wage? @Donald Drumpf, also, San Francisco has made it legal for illegal immigrants to vote in local elections. Which is insane. But that probably didn’t happen either right? Since it goes against your narrative. CA is fûcking nuts. Progressive ideology trumps reason and logic. @big freedom, The draft came to an end when the United States Armed Forces moved to an all-volunteer military force. However, the Selective Service System remains in place as a contingency plan; all male civilians between the ages of 18 and 25 are required to register so that a draft can be readily resumed if needed. What I read there is that the draft didn’t technically end. Because if they needed to they’ll start it right back up. @big freedom, i’m not sure about the kids growing up slower now than they did in previous generations. Because you failed to take into account that they’re also getting slammed with significantly more information and having to learn significantly more things in school then they did in previous generations as well. @Seohn, exactly. But in practice we do not have a draft. I’m for eliminating the selective service all together. Either that or force every single able bodied 18yo to serve. Maybe then we would actually pay attention to the BS wars we get into but never get out of. Until then, pay attention to the science that says humans brains don’t fully develop until around 25 or so. Stop trying children as adults. And ffs don’t listen to them when it comes to important decisions about how to run a country. @Seohn, that’s all true. Doesn’t change the fact that more 20+ year olds still live with parents and have less responsibilities than they did in previous generations. I’m not saying that it’s bad or good, it just is. It’s the reality of who we are now. @big freedom, do you know what my biggest problem with the way you phrase things like this. You take things out of context. And then say it in a way that makes it sound like it affects far greater than it really does. Kind of like what Trump does. Yes San Francisco Okayed voting for illegal immigrants. What you implied is that it allows them to vote on every local election in San Francisco. What you failed to mention is that it only applies to school board of education. Proposition N is a Charter amendment that extends the voting rights in San Francisco School Board elections to non-citizen residents of San Francisco who are of legal voting age, not in prison or on parole for a felony conviction, and who are parents, legal guardians, or legally recognized caregivers of children under the age of 19 living in San Francisco. https://sfelections.sfgov.org/non-citizen-registration-and-voting Being misleading and blowing things out of proportion is the same is spreading fake news. @big freedom, that’s a cultural thing. Did you know in Japan it’s common for families to live together well into their old age and for the kids to take care of their parents as they got old. The whole striking out on your own when you turn 18 it’s an American thing. Has nothing to do with what you stated. Plus you also forget to take into account that it’s a lot harder to live on a single income that it was decades ago. I mean come on if you’re going to use this as an excuse. At least remember why these things have changed and why people don’t move out as soon now as they used to. I mean if I wanted to argue that. It used to be that woman stayed at home because the man could make enough money off of a single income to live and supportive family. Understand more about why things like this have changed before making a comment please. @Seohn, I said “local elections” And yes, I am aware of my bias but I resent bias in the media and in elected politicians. Here’s an example: California for a long time said “we will not allow illegal aliens to work in this state” then it softened to “ok we know they’re working here, but they’re not allowed to get a drivers license” which then became, “ok it doesn’t make sense to have them here and not be able to drive, we’ll allow them to drive, but they cannot have access to the free healthcare system” which they now have full legal access to government provided healthcare. And then it was “we will never allow them to vote” to now it’s “we’ll allow them to vote, BUT only in local school board elections” You see the trend here right? I despise being lied to by compliant media and government with a clear agenda. California is hell bent on allowing full rights, including voting, to illegal aliens. And that’s their prerogative, but be honest about it. Don’t keep sneaking it in. @big freedom, if you’re going to have bias then you really don’t have much place being mad at the bias of the media. I and many others defined that as being a hypocrite. And local elections can mean many things. Whereas this is purely for the Board of Education and only for the Board of Education. Someone could interpret “local elections” as the mayor or other elected positions in the local area that aren’t the “Board of Education” I’m not saying I agree with then having the right to vote. I’m just saying at least speak the information correctly. If you want to help stop fake news. You have to stop also speaking things out of context. Because it’s rumors that cause things to get blown out of proportion. Which is why the McDonald’s hot coffee incident is now used for studying law. It was completely misreported near it end. Because one person reported it, then the next, then the next until eventually it was cut down to mean something completely different. @Seohn, that’s completely ridiculous. Everyone has a bias whether they admit it or not. The news used to be (and sometimes still claims to be) unbiased, or Fair and balanced. They actually teach in journalism school how to spot and remove bias from a story. Now, because it gets ratings and therefore more money, it’s extremely biased. It’s no longer presenting the news and allow you to come to your own conclusions. It’s presenting a story designed to lead the audience to a specific narrative based conclusion. Both sides are guilty and anyone that prescribed to a specific side allows themselves to be led by their nose by a lying corrupt biased media. And I’m not the media. I’m not responsible for anyone other than myself. If you don’t agree that the media has a responsibility to remain unbiased, then it can no longer be called news. Its opinion which is fundamentally different. @big freedom, kind of like how the whole kick them while they are down comments by that one politician got taken away of proportion by Fox. Because they conveniently edited the rest of what he said off. So if you want to help stop bias in the media you have to stop bias within yourself and also be willing to speak those extra words to clarify exactly what you’re saying. @Seohn, wrong. I despise Fox for their bias. I despise CNN for their bias. Again, I’m not a news reporter. I have no obligation to anyone other than myself and my family. If the “news” only presents something that fits a narrative it’s not news. Its opinion. I am allowed to have biases, every individual is allowed. That’s completely natural. If you understand your bias and go out of your way to take in alternative views, you’re more aware of the shills on tv and newspapers displaying overt bias. Which is antithetical to what they claim to be. @big freedom, me on the other hand I always feel obligated to speak the truth no matter who I’m talking to. Based on the knowledge I have of the subject determines whether not I even speak about it. And if I’m not entirely sure about something I’d clarify whether not I’m not entirely sure about something. Or I don’t speak it. Does that mean I’m always right? No. Sometimes I get information wrong because I picked a bad source. But I try to make sure my information is correct before I fully commit to using it in a debate or argument. But I do enjoy pointing out hypocrisies. Which is something you don’t always need knowledge of the subject do. You can analyze what someone has said and find them. @Seohn, part 1 of 2. So you’ve conflated me with national publications such as Fox, NBC and CNN? I’m flattered! If you don’t see the difference between me arguing and promoting a side, using reason, logic and occasional emotion, with national news media, or even local news media, then there is no point continuing this back and forth, as fun as it is. Have you ever taken a debate class or logic class? A persuasive argument is designed to elicit an outcome that one desires. It’s a useful tool. An informative speech is designed to give unbiased information and not drive to a specific outcome. I’m trying to have an actual debate with you to persuade you to admit your bias and be open to hearing another point of view. I’m doing this because your vote unfortunately has an effect on laws that govern me. I am very libertarian in my views. I do. It wish to effect anyone else’s life in a negative way. I do not wish for anyone else to effect my life in a negative way. @Seohn, part 2. I see overly involved government as a negative. I want more people to be like me. I acknowledge that as a bias. The media has a responsibility to not present their bias to their audience. They are not supposed to try to persuade you to have their point of view. They are supposed to present facts, whether it fits their individual bias or not and not try to influence opinion. That’s why newspapers have editors, and opinion articles specifically stated as opinion. They used to always try to plainly spell out what is opinion and what is news. See the difference? @Seohn, you claim to “speak the truth” but I guarantee that you leave out facts that don’t fit your biases. Just like you pointed out above for me. I guarantee that there are facts about illegal immigration or gun control that go against your beliefs. You don’t use those facts in your arguments. Don’t pretend to be this saint and holier than thou. You have a bias and use it to persuade people to try to get them on to your side. You are also not the media. @big freedom, Yes you’re really reaching to come out on top on this one. But what you fail to realize is that I’m pointing out how you’re a hypocrite. You’re bitching about the news articles well also claiming your bias. That is literally what I said and meant yes you’re really reaching to come out on top on this one. But what you fail to realize is that I’m pointing out hell you’re a hypocrite. Your bitching about the news articles while also claiming your buyers. That is literally what I said and meant. I do see the difference. You are not a news organization but you are doing what they do which makes you a hypocrite. You made a claim about elections that wasn’t entirely true because you left off the information. Which means that’s a fair comparison because you’re doing what they do. You don’t even see your own hypocrisy. You have failed to plan out my bias because I’ve said nothing that elicit such things. @big freedom, and now because you don’t want to face your own hypocrisy that I’ve pointed it out so blatantly you’re trying to divert and say that I have no idea what I’m talking and that I am the biased somehow for pointing this out. I honestly don’t care who wins or loses this debate. That’s for other people to decide. @big freedom, Just an FYI. I’m completely open to hearing a different point of view. I do spend a lot of my time learning about other countries. Mostly Japan though. I really like Japan and plan to go there eventually. But I’ve also learned that it’s better to research stuff for myself when someone speaks about something because they tend to omit things, as you did. So I can’t really trust your point of view if you only speak the whole truth to friends and family. @big freedom, it’s good that you understand where your biases are. If your goal is to counter those biases thats good. You also need to learn to spot your own hypocrisies too though. It’ll help prevent holes in your arguments. @big freedom, I in no way was trying to counter your original argument other than pointing out that you didn’t speak the whole truth about what they could vote on. My intended goal wasn’t about defending or countering your argument against illegals voting. There is no strawman here. And if that’s what you saw. Then you really do need to get your biases and hypocrisies under control. Because you’re not doing a very good job of it. @Seohn, you’ve spent well over an hour arguing something that I admitted in comment 2. You’ve actually presented a few straw men. 1. “if you only speak the truth to friends and family” 2. “Because of Japan’s culture we now live with our parents longer” 3. “One or two people does not constitute the entirety of the political party” I’m absolutely trying to counter your argument and absolutely enjoying pointing out your hypocrisy while attempting to shame me for mine. @big freedom, Side note. I don’t care for the slippery slope defense/argument. Just because they allow them to vote on Board of Education doesn’t mean it’s going to snowball into them voting for presidential elections. That’s not much different than saying, I’ll start eating one healthy meal a week. If I do it’s going to lead to me eating all healthy meals. Or if we don’t do something more with gun control we’re going to start having mass shootings every day. (I am for people owning guns by the way) Or another more well known argument. If we allow gay marriage. What’s next allowing people to marry animals. Here’s another famous one. Marijuana is a gateway drug, therefore it’s illegal. Gateway drug meaning that if you do marijuana and it’ll snowball into harder substances. An argument often used to keep it illegal. Thats why I never use the slippery slope as my argument or defense. Just because you change one thing doesn’t mean it’s going to lead to a bunch of things changing. @Seohn, correct. Not all slopes are slippery. But when they have repeatedly lied about the last step, I would have to be insane to believe them on the next step. And that is what California voters are. Insane. They have allowed their ideology to blind them to facts, logic, and reason. @big freedom, but I don’t think they should be allowed to vote. On the merits that they aren’t legal citizens. And only on those merit. Not because it’s a slippery slope. @Seohn, ok...? It’s not about if you think they should be allowed to. It’s about the state that continues to lie, and and continues to give more and more rights and privileges to illegal immigrants. I’m not predicting that they will. I’m pointing out the lies of the past. Why would you trust someone who has lied repeatedly about this specific topic. I won’t. They’ve proven that they can’t be trusted. I’ll do everything I can to make sure that they aren’t given a chance. It won’t make a difference because Californians have proven that they are beyond irrational. But that doesn’t mean I will give up. Because it matters. It will matter a lot to my children. I don’t want to give them a burden that they don’t deserve to bear. @Seohn, congrats! You identified the straw man I used to point out your straw men. Next step is learning to not use them yourself during the debate. @big freedom, but the biggest thing is that I wasn’t arguing for or against your original statement about illegals voting. I was just telling you that you did not give all the information. I wasn’t defending your argument nor was I supporting your arguments I was pointing out facts. There can’t be a strawman if I’m not fighting for or against your argument. By the very definition of what a straw man is trying to do. I’m just telling you get your information straight and don’t omit parts. @big freedom, but hey if you can’t handle constructive criticism. That’s on you. @big freedom, I do agree some of California’s laws are just out right dumb. Or at least they seemed that way. Some are definitely laws that I believe have no reason existing. Or at least I have not been presented with a compelling enough argument to support it. but even with all the past history I still don’t like applying the hold if one thing leads to another defense. I preferred to hold each individual thing on its own merits. which is a huge reason why I think all amendments to anything proposed in politics should be voted on on an individual basis. Because the people who tack on amendments as a method of blocking new laws from going through will come to an end. @big freedom, Why would I trust someone who has lied repeatedly about this specific topic? Now you understand why I don’t like Trump. He lies about petty stuff so how can he be trusted with major issues. And yes, I agree I don’t trust people continually lying. I can understand that point of view. But I don’t think it works well as a reason to fight against allowing illegals to vote for the Board of Education. It’s better to just stick with the fact that they’re not citizens so therefore they can’t vote as the argument against. If we apply that to, all politicians lie and therefore can’t be trusted. Then nothing will ever get done or change. Better to stay balanced and judge things on an individual basis I think. At least that’s my opinion on that one. @big freedom, The thing is, and I pointed this out a couple times already. I wasn’t debating with you about the subject of illegals voting. Debating implies it I was trying to sway your opinion one way or the other about the topic. No I was just trying to point out that you didn’t give the full information about what they were gaining the right to vote for and how it can be misinterpreted as getting more than what they really are. And I’ve I already agree with you that they shouldn’t be allowed to vote on anything that affects the overall politics, laws, and rules of the area. If they can’t take the time to go through the citizenship registration. Then they can’t vote. It’s that simple. @Seohn, so why did you build straw men #’s 1 and 3? You can move the goal posts all you want. You can throw as many red herrings in as you want. My original statement is still true. CA is trying to change there law. It was introduced in state legislation. It didn’t pass that time, but it will be presented again, and again. To quote you, you’re trying really hard to come out on top of this. You point out hypocrisy but fail to see your own hypocrisy. You continue to dig in and debate something well past the point of a logical end. You use many logical fallacies, but jump all over one, admittedly, biased sentence. We can continue this if you want, but if we are, I want to hear you admit your biases, own up to your hypocrisy and quit using logical fallacies. @big freedom, first off you made the claim on number 1, that you only speak the truth with friends and family that you feel no obligation to speak the truth with anyone else. You yourself said that. That’s why brought it up. The, one or two people comment. I only commented on that one because I feel like the political climate has escalated way too far. So much so, that when one crazy person does something on that side of the political spectrum. For some reason the opposing side tends latch on and start calling all Democrats lying socialist liberals or all Republicans White supremacist. I didn’t care about what the subject of the debate was. Only that I think that mentality is used against something to blame an entire party is wrong and is hypocritical. Because both sides do it. In other words, trying to help all build a better argument. While educating people of how both sides do the same thing. It’s silly to assume that a majority of a party supports something one person want. @Seohn, ehhhhh. Wrong. I never said “I only speak the truth to my friends or family” if you’re going to make up lies, what’s the point of this? “You’re trying to help all build a better argument”.. by lying, using logical fallacies and being a hypocrite? @big freedom, There are specific things that I don’t agree with anymore and I think need to stop because it’s just escalating hostilities in the current political climate. That’s why I kind of jumped into the discussion. I wanted to point at those things. I admit it was more about those things rather than about the actual argument itself. I agree that you’re right about not giving them the right to vote. I’m with you on that one. I just think you should’ve explained it better. And I felt compelled to jump in to point it out. I will say. I’m very much for judging everything on individual merits and applying as much science and logic to a decision as possible though. We may not agree on everything. And that’s OK. But I will say that when I feel like an argument could’ve been better. Or had hypocrisy in it. I tend to focus on those. Because I’m ok and open to my opinion being swayed by a good argument. But if I see anything hypocritical in it then it’s less likely to be swayed. @big freedom, you are correct, I miss phrased that. If I had proofread that and thought about it more I might’ve realized that mistake. I intended that to be more along the lines of, you said you only feel obligated to speak the truth to your friends and family. That’s how it should’ve been worded and that’s my mistake. It completely changes the meaning. From what I originally intended to be was that, because you don’t feel obligated to speak the truth with everyone but friends and family, so therefore can’t be trusted to speak the truth when talking to anyone else. That was an error of poor communication on my part. I try hard to explain exactly what I mean but sometimes I phrase things wrong. @big freedom, yeah...I feel like if you ding pay taxes then you don’t get to decide what happens with the money. Then again...I didn’t know exactly how taxes worked when I was 18. Hey, I went to college with that guy!